I guess I’m gushing, but there is much about the 24 years since the Mabo decision in the High Court which speaks volumes for Australians and our society. Chiefly, the peaceful acceptance of that major change to our land law and the very wide acceptance of the change within a short span of years tell of a fundamental willingness to assist the less well-off and the disadvantaged. There will be many good reasons to celebrate that decision, and its aftermath, on 3 June 2017, the twenty fifth anniversary of the Court’s decision. This is not a rehearsal for that occasion. Because this year we have another reason to celebrate Mabo. This year it’s 25 years since the hearing of the Mabo decision in the High Court: it was heard between 28 and 31 May 1991. This gives an opportunity to honour the unsung heroes of Mabo, the lawyers involved. After all, there’d be no Mabo without the perceptive, dogged and fearless advocacy of the rights of the indigenous peoples by the Mabo lawyers. And by honouring them, we honour all lawyers who fight for the oppressed, unpopular, disadvantaged and vulnerable. It started in late August 1981 when lawyer Barbara Hocking presented a paper to a legal conference in Townsville. The conference was organised by the Aboriginal Treaty Committee and was co-chaired by Eddie Mabo. A fellow presenter was a local solicitor, Greg McIntyre. Thereafter, Mabo and 2 fellow Miriam People, David Passi and James Rice, engaged McIntyre and Hocking to institute proceedings on their behalf, and on behalf of their family groups, seeking declarations that they were the owners (in the sense of holders of native title by virtue of their traditional laws and customs) of the Murray Islands. A few months later Ron Castan QC was engaged. Hocking left the team in 1986 to become a member of a Commonwealth Tribunal. McIntyre and Castan stayed for the long haul, which ended more than ten years later. The proceedings were commenced in the High Court on 30 May 1982. The statement of claim asserted that since recorded history began the Murray Islanders maintained a system of laws, customs, traditions and practices for determining questions concerning ownership of, and dealings with, land, seas, seabeds and reefs. It was said that, in accordance with these laws, customs, traditions and practices, the Miriam People owned (or, alternatively, had proprietary interests in or usufructuary rights in relation to) the lands, seabeds, reefs and fishing waters of the Murray Islands. The Miriam People were alleged to be “a distinct group united by race, descent or ethnic affiliation [which] have been and are the sole inhabitants of the Murray Islands”. Before the High Court could decide whether those assertions were sound in law, it needed to find the facts of the Miriam People’s occupation of the Islands. This involved “a consideration of public records and other old documents”. The first argument in the High Court, which the Mabo lawyers lost, concerned the court which would fulfil the function of fact finding. In early 1986 the Court ordered that all disputed issues of fact be remitted to the Supreme Court of Queensland for determination. “The existence of traditional rights in the Murray Islands as claimed by [Mabo and co] is a question which may raise complex issues of fact and law of fundamental importance to all Australians”. But in 1985 the State of Queensland launched a pre-emptive strike which would have had the effect of preventing the matter of “fundamental importance” being decided. The Queensland Parliament, the only unicameral legislature in Australia, enacted the Queensland Coast Islands Declaratory Act 1985. The State of Queensland submitted that this Act retrospectively abolished all traditional communal or personal rights and interests as the Murray Islanders may have owned and enjoyed in or to the land on the Murray Islands before its enactment, with no right to compensation. In 1988 Castan and Hocking were again briefed by Greg McIntyre, and they were joined by Bryan Keon-Cohen, to represent Mabo and co in contesting the validity of the Queensland Act in the High Court. By then McIntyre had returned to his native Western Australia. This meant that no member of Mabo’s legal team was then based in Queensland, a fact which appears to reflect the power and hostility of the State in Bjelke- Petersen’s Queensland at this time. The contest in the High Court was run on a number of bases, the strongest being the argument that the operation of the Queensland Act was inconsistent with the operation of the Commonwealth Racial Discrimination Act and it was therefore ineffective by reason of s109 of the Constitution. As to that argument, upon which the successful of Mabo’s claim ultimately depended, it was a close run thing. Three of the seven High Court judges held in favour of the validity of the Queensland Act. However, Brennan, Toohey and Gaudron JJ held that by extinguishing the traditional legal rights characteristically vested in the Miriam people, the Queensland Coast Islands Declaratory Act abrogated the immunity of the Miriam people from arbitrary deprivation of their legal rights in and over the Murray Islands. This meant that, in contravention of s10 Racial Discrimination Act, the Queensland Coast Islands Declaratory Act resulted in the Miriam people enjoying their human right of the ownership and inheritance of property to a “more limited” extent than others who enjoyed the same human right. Deane J came to the same conclusion. In a finding crucial to the continuance of native title after the 1992 decision, the three judges stated that “In practical terms…if traditional native title was not extinguished before the Racial Discrimination Act came into force, a State law which seeks to extinguish it now will fail”. Essentially, whilst the Racial Discrimination Act remains in place, and its interpretation is not altered by the High Court, native title cannot be extinguished by State laws. The question whether traditional native title was extinguished before the Racial Discrimination Act came into force was not addressed in the 1988 proceedings. That was the ultimate issue decided in Mabo v Queensland (No 2)  HCA 23; (1992) 175 CLR 1. Before then the proceedings were remitted to Moynihan J of the Supreme Court of Queensland. His Honour made detailed findings in relation to the issues of fact remitted to that court. It was said that those findings “unavoidably contain areas of uncertainty and elements of speculation”. However, his Honour made two findings worthy of note, one important and one quirky. Moynihan J found that there was apparently no concept of public or general community ownership among the people of Murray Island, all the land of Murray Island being regarded as belonging to individuals or groups. Secondly, he disbelieved Eddie Mabo. That finding lead to Greg McIntyre alone appearing for Mabo in the famous Mabo case. Castan QC and Keon-Cohen appeared for Passi and Rice. This division of representation was made because the finding against Mabo’s credibility lead the legal representatives to consider that Eddie Mabo’s case was weaker than his co-applicants. 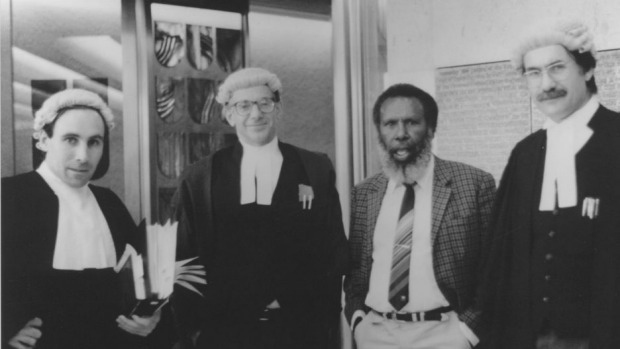 The extent of the submissions made on behalf of Eddie Mabo in the final High Court case are therefore not the stuff of legends, but merely: “I adopt the submissions of my learned friend, Mr Castan QC”. That that was not the point did not start with Mabo’s brief in 1981 nor end with the High Court’s 1992 decision. Ron Castan, for instance, had been the founding secretary of the Victorian Aboriginal Legal Service in 1971. He represented other indigenous in land rights and race discrimination cases, such as Koowarta v Bjelke-Petersen  HCA 27; (1982) 153 CLR 168. For years he served as a Human Rights and Equal Opportunity Commissioner in Victoria. Similarly with Greg McIntyre. Before Mabo was finalised he successfully represented the indigenous applicant in Bropho v Western Australia  HCA 24; (1990) 171 CLR 1. After Mabo, he represented the Kimberley Land Council and others in the pastoral leases case involving the Wik Peoples and Thayorre People. From 2000 he’s taught a course in Indigenous Peoples and the Law at the University of Notre Dame Australia and in 2011 at the University of Western Australia. Before Mabo, Bryan Keon-Cohen lectured at Monash University law school and then worked at the Australian Law Reform Commission. He’s appeared in many indigenous rights claims subsequently. These lawyers are beacons, and should be honoured, celebrated and revered. But they are not unique or alone, so our pedestal should not made be too high, for it is a level to which all lawyers should aspire. The Mabo lawyers are exemplars of the most worthy calling which recognises that the law exists to serve the community, that lawyers are essential to achieving that outcome, and that lawyers should particularly assist those whose needs are greatest. But now I’m back to gushing (and I do so unapologetically). The paper was titled “Is might right? An argument for the recognition of traditional Aboriginal title to land in the Australian courts” and opened with this sentence: “With the single exception of Australia, all of England’s ex-colonial countries have legally upheld the basic principle of recognition of the title of their indigenous people”. The paper can be found at http://www.nfsa.gov.au/digitallearning/mabo/info/doc6.htm. The peoples were also called Meriam, interchangeably, throughout the High Court decisions. These are Mer (aka Meer), Dawar (Daua) and Waier (Waua). Remembering that the hearing was conducted from 28 to 31 May 1991, it can be seen that nine years elapsed from the date of commencing the proceedings. HCA 8,  per Gibbs CJ. Mabo v Queensland  HCA 69; (1989) 166 CLR 186, per Wilson J at . The Bill was introduced to the Queensland Parliament on 2 April 1985 and passed on 9 April 1985. There were separate decisions to this effect from Mason CJ, Wilson J and Dawson J.
  HCA 69, per Brennan, Toohey and Gaudron JJ at . See Determination of Facts (unreported, Qld Supreme Court, 16 November 1990). HCA 23 per Deane and Gaudron JJ at . Wik Peoples v Queensland  HCA 40; (1996) 187 CLR 1; (1996) 141 ALR 129; (1996) 71 ALJR 173. 800 years of Magna Carta. Big Deal! What’s its relevance for succession lawyers? A STEP IN THE EMANCIPATION OF WOMEN The Extent of a Solicitors Duty with a Clients Estate Planning Where are we at with advocate’s immunity? Court delays. Isn’t it time to join up the dots?